Idol Series / Re: WI14 camo - just picked up for my son, any info? The following is a spec listing that I cut and pasted from the Musicians Friend website. There are 44 reviews about the WI14 model on that site. Various video reviews are out there on the web too. It ranks pretty high as a good beginner guitar. Basswood bodies are often used on mid to lower end guitars, but they have a fat, but well-balanced tonality with good midrange. Washburn stock pickups are not the greatest in my opinion. The price of better pickups might be close to 1/2 the value of the guitar. I don't believe that the WI14 design would have gone through any changes other than finish. 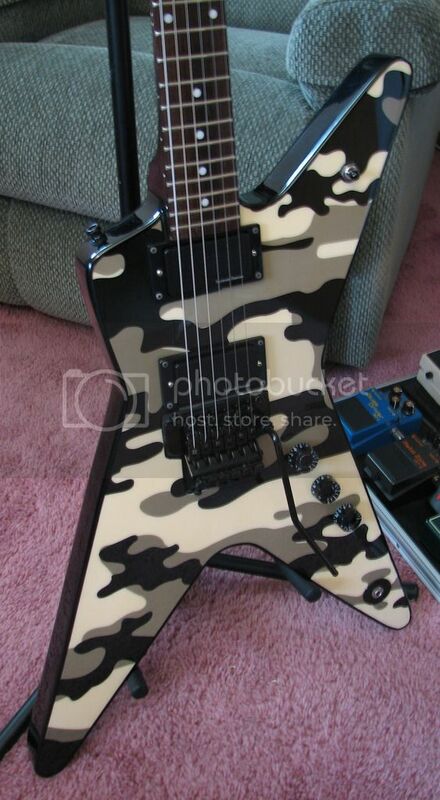 General Discussion on Washburn Electric Guitars / Re: Informations about Dime guitars come back ? Is it supposed to be a D-61 verses DN61 ? Search on Washburn FV, A23, or RR... Maybe??? I Googled "WonderBar tremolo instructions" and saw that someone has the pages from Washburn's manual out there on Pinterest. Just a suggestion... I'm not sure what electronics has to do with it, other than maybe a grounding point. A blank opinion regarding playability... Don't let that bias you. I personally LOVE the playability of my Dime guitars. Playability deals with details that affect comfort. 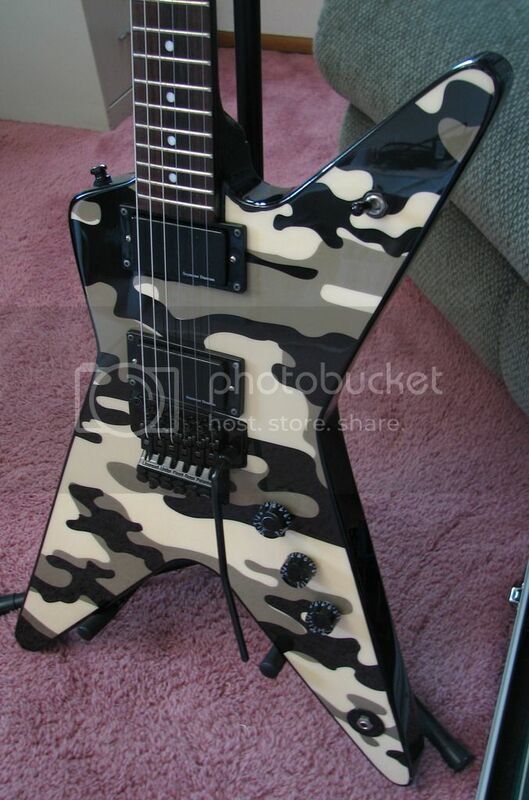 The mentioned Snow Camo 333 has a front strap connect location where the (top/neck) horn would be verses behind the neck joint as with many Korean and USA Dime models. It helps the balance when playing standing up, but the other location works fine for me too (not a big deal IMO). The lack of a top/neck horn is comfortable for me since I'm not getting jabbed in the chest when I play setting down. The shape on the bottom edge sets perfectly on my leg. The alder wood body is a medium-weight wood with a full-bodied sound and good sustain qualities. The weight is almost the same as my mahogany Les Paul style guitar. I have a preference for resting part of my forearm in the center of the the top/rear horn that just feels right to me. The neck shape is relatively thin with a flatter D (larger radius) shape. I have a collection, but they get played. Photos have to be stored elsewhere online such as Photobucket.com. Photos cannot be directly pasted into a posting or uploaded to the site. Several people here seem to use Photobucket, but there are a few other free sites out there to choose from. After your photo is stored, use the share selection (at Photobucket, ect...) to show link options. Copy the IMG link and paste it into your forum message. Show Us Your Washburn / Re: HELP, Please!!! I don't really have much spec info to share, but it's a 1984 A-5V-BBR Stage Series. V stands for vibrato. It has a mahogany body and maple neck. It was made in Japan by Matsumoku. The following link just has the listed $499 retail price from 1984. The site is missing other info on it. Hopefully knowing the correct model helps a little with your info search. I'm going to guess that it's black (B) in color. Maybe...?